#1 RATED. MOST AWARDED. Find out why, and how you can profit. We’re proud to be the new exclusive distributor of American Standard in the markets served by our branches in New York and New Jersey. 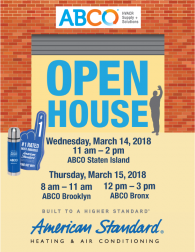 Stop by for an Open house Free Lunch or Breakfast and learn about all the opportunities with ABCO and American Standard.